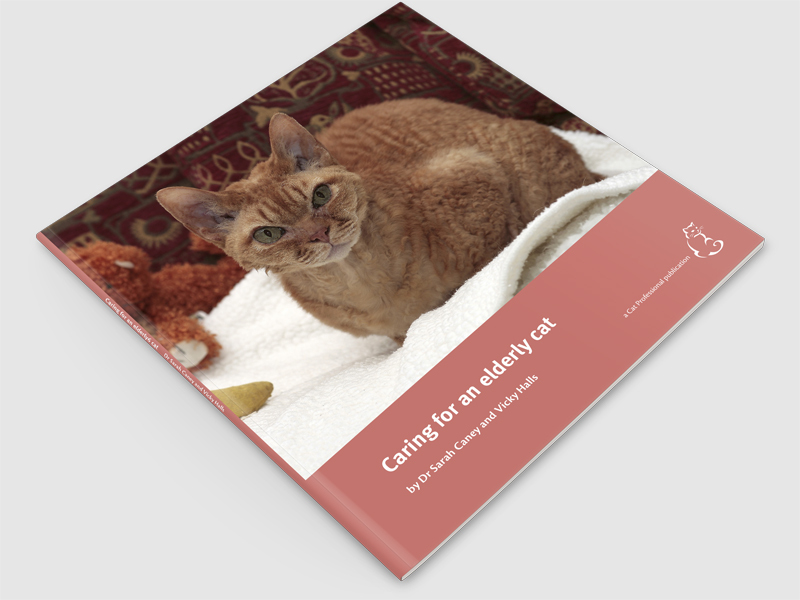 ‘Caring for an elderly cat’ has been written as an information source for all of those working with, and caring for, elderly cats. Buy the print version (softback) along with our online webinar "Maintaining health in the older cat" for £30.00, saving £10.99. Use discount code "ElderlyPack" at the checkout after adding both items. A 136 page, fully illustrated book aimed at cat owners and veterinary professionals, launched April 2016. ‘Caring for an elderly cat’ has been written as an information source for all of those working with, and caring for, elderly cats. 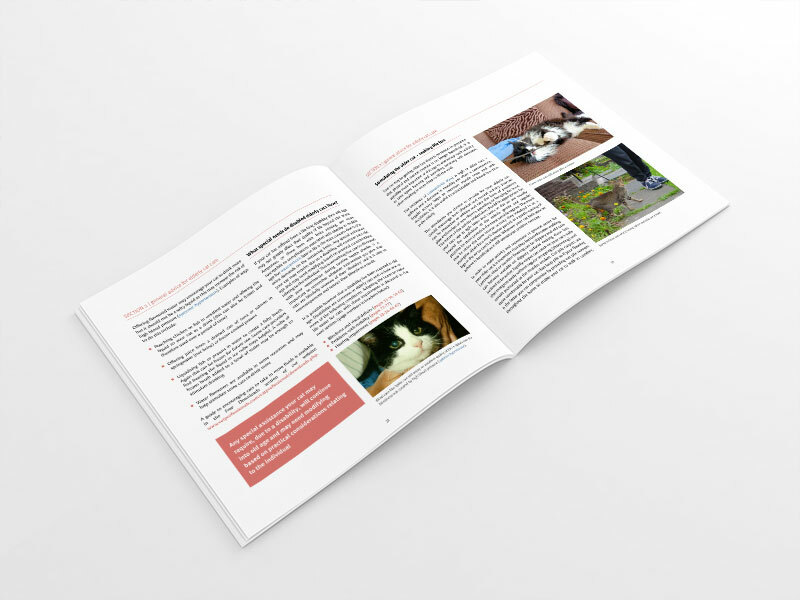 The first two sections of the book discuss the changes that commonly occur in a cat’s behaviour and health as they age with advice and tips on maintaining quality of life and well-being. The third section focusses on diagnosis and successful management of common old cat illnesses such as chronic kidney disease, hyperthyroidism and diabetes mellitus. There is advice on how to spot illness at an early stage, nursing sick cats and giving medications. 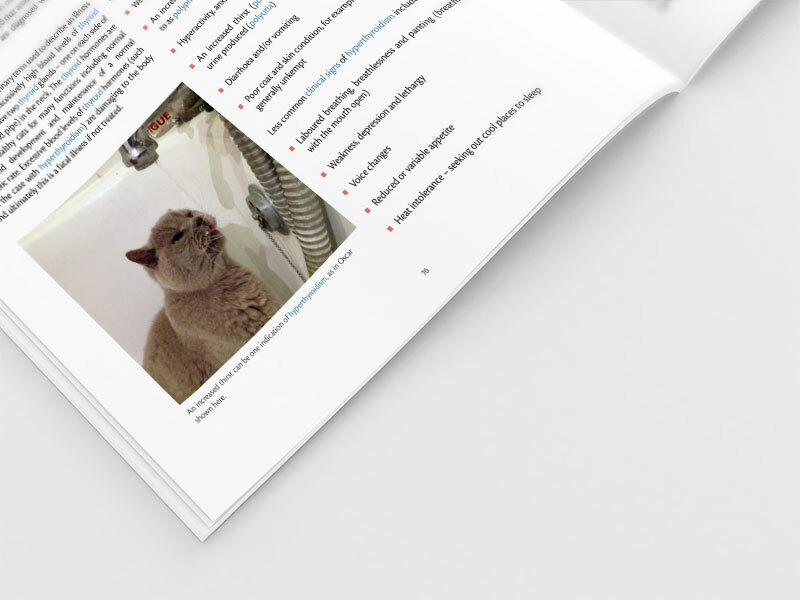 Section 4 provides advice on successful management of common behavioural problems of the elderly cat such as night-time vocalisation and toileting accidents. Section 5 is dedicated to judging quality of life, end of life decision-making and coping with bereavement. 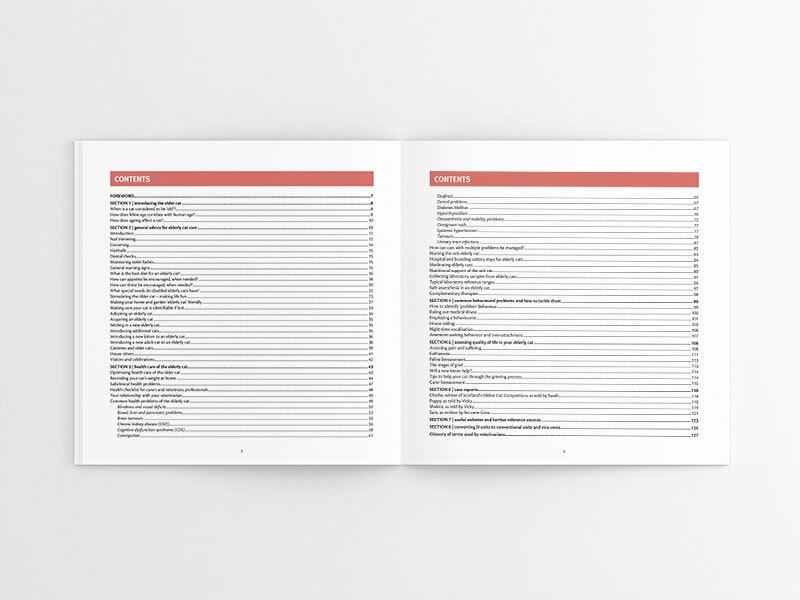 Several inspiring elderly cat case studies are presented in Section 6 with the remainder of the book dedicated to a glossary of veterinary terms and other reference material. This book is an essential read for all owners of elderly cats and anyone else who lives with these special felines. It will also be of immense benefit to veterinary nurses, animal behavioural councillors, veterinarians, owners of catteries, cat sitters, people who work in pet shops and anyone else in anyway involved in caring for cats, especially older ones. It explains why elderly cats are so special, and why they have extra needs that must be individually tailored to each cat. It details how cats change with age, why increased veterinary attention is needed, what diseases are most common and how to treat them. Perhaps most importantly, this book explains how we can keep our elderly cats more comfortable in their old age, so that their quality of life is as good as it possibly can be. It concludes with an insightful discussion on deciding ‘end of life’ issues, followed by some heart-rending Case Histories. I can whole-heartedly recommend this book to all cat lovers who want to do the very best for our precious ‘old soul’ kitties. Sarah and Vicky have outshone each other this time, this book is a must have to any cat owner, as it will prepare everyone for when their cat gets older, I have enjoyed reading this book, and at times I could have sworn a chapter or two had been written by my own cat, any cat owner will have to hunt high and low to find a better reading and understanding of the elderly cat than this, I could write more but I have to make a few adjustments to my house to make sure my own elderly cat is comfortable and happy. Big thanks to Sarah & Vicky for this wonderful insight into the elderly cat. This book will offer comfort and reassurance for the owners of the elderly cat. From simple tips for environmental changes to giving owners an insight to the potential medical problems that may occur, and some common clinical signs that accompany them. Owners will gain an understanding that these changes are common, and won’t be as hesitant to get their elderly cat checked. When is a cat considered to be ‘old’? How does feline age correlate with human age? How does ageing affect a cat? What is the best diet for an elderly cat? How can appetite be encouraged, when needed? How can thirst be encouraged, when needed? What special needs do disabled elderly cats have? How can cats with multiple problems be managed? Will a new kitten help? Sarah qualified as a veterinarian in 1993 and has worked as a feline-only clinician for more than twenty years. Sarah has authored and co-authored a number of other Vet Professionals publications including ‘Caring for a cat with chronic kidney disease, ‘Caring for a cat with hyperthyroidism’ and ‘Caring for a cat with lower urinary tract disease’. Sarah currently lives in Scotland with her family (including one cat, Sooty) and enjoys seeing both first opinion and referral feline patients. Sarah’s detailed biography can be found here. Vicky’s career started in veterinary nursing and she has worked as a Pet Behaviour Counsellor for many years. Vicky has authored several books on feline behaviour which have been best sellers in the UK and abroad. In 2008, Vicky was voted the ‘Nations favourite cat author’ by readers of ’Your Cat’ magazine. Vicky currently loves in England and her detailed biography can be found here.